There is nothing like a freshly cleaned carpet. Clean, odor free, bright and looking like new – freshly cleaned carpets make a home more enjoyable. Unfortunately, clean carpets only stay that way for so long. In fact, it can sometimes seem like the cleaner the carpet, the more likely something is to get spilled on it. At Chad’s Carpet Care, we offer you a way to preserve that just-cleaned look for as long as possible. By applying Teflon carpet protection directly after cleaning you can make sure that anything the comes into contact with your carpet is easier to clean up and less likely to stain. We believe that carpet protection is well worth the money, especially if you want to extend the life of your carpet and the time between professional cleanings. If you are like most people, you probably cannot live without your non-stick cookware. Teflon and the various imitations make cooking so much easier because you do not have to worry about food sticking. It also makes cleaning a breeze – the same way it does for your carpets. 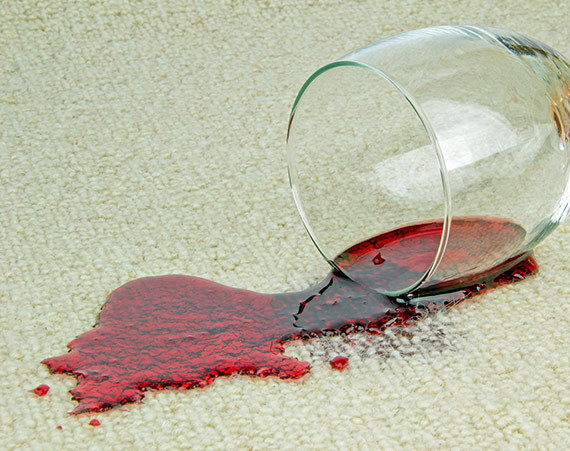 Stains occur when a material, usually a liquid, penetrates the fibers of your carpet and stays there. Teflon carpet protection does a remarkable job of preventing staining because it repels the liquid from the carpet fibers. As long as you wipe up the spill promptly, the liquid does not have a chance to make its way into the carpet. Although the magic of carpet protector is most visible when you spill a liquid, the Teflon also does a great job at repelling dirt particles. You can vacuum up the dirt and other material more easily from protected carpet, preventing it from penetrating the fibers and causing staining and wear. When you imagine the application of carpet protector, it is easy to see it as a film that goes over the carpet surface. In reality, the protection is even more thorough. Teflon carpet protector coats each individual fiber, making the protection as complete as possible. You do not have to worry about your health or the health of your family and pets with Teflon carpet protection. The material is safe, non-toxic and CFC-free. To gain the full protection of Teflon carpet protector, it must be professionally applied. Our cleaning team first cleans your carpets thoroughly before we spray on the carpet protector, which means you start with clean flooring and then apply the protective layer of Teflon. The carpet protector dries quickly, so you can be back to using your carpets in a relatively short amount of time. Carpets are an important component of your home, so they deserve to be protected. Our professional carpet cleaning service, followed by the application of Teflon carpet protector, ensures that your carpet lasts as long as possible. If you are interested in learning more about our Teflon carpet protector or other cleaning services in the South Houston and Galveston areas, please contact us today. In a short amount of time, we can have your carpets looking clean, vibrant and beautiful again.